Maina has suddenly overtaken Nnamdi Kanu as the most wanted man in Nigeria. The Minister of Interior, Abdulrahman Dambazau has asked the former chairman of the Pension Reform Task Team, Abdulrasheed Maina to report to the Economic and Financial Crimes Commission (EFCC). Dambazau’s directive was contained in an official correspondence sent to the anti-graft agency by the ministry. The directive is in response to a letter written to the ministry by EFCC asking that it makes Maina available for questioning. EFCC's procedure for inviting senior government officials for questioning is to write to the head of the ministry or agency where the person works. It was gathered that Dambazau upon receipt of the letter directed Maina to report to the commission as requested. The minister equally wrote back to the EFCC informing it that he has directed Maina to honour the invitation. The last time Maina reported to work was on Friday. His whereabouts is unknown since he was dismissed from the service on Monday by the president. 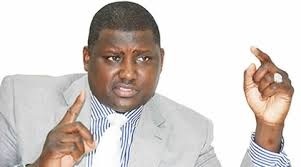 A source at the EFCC said, “The Ministry of Interior sent a letter to the EFCC on Tuesday informing the commission that it had mandated Maina to make himself available for questioning at the EFCC headquarters in Abuja.